Beautiful Colorado Springs, Colorado -- the land of mountains and crisp, clear skies. Unfortunately, it is not the land of vegan restaurants or even vegan options! 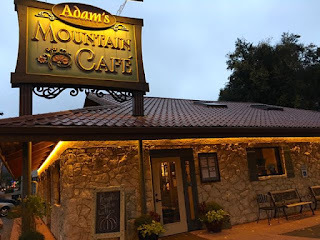 I had to reach far and wide to find them and Adam's Mountain Cafe was one of my best finds. 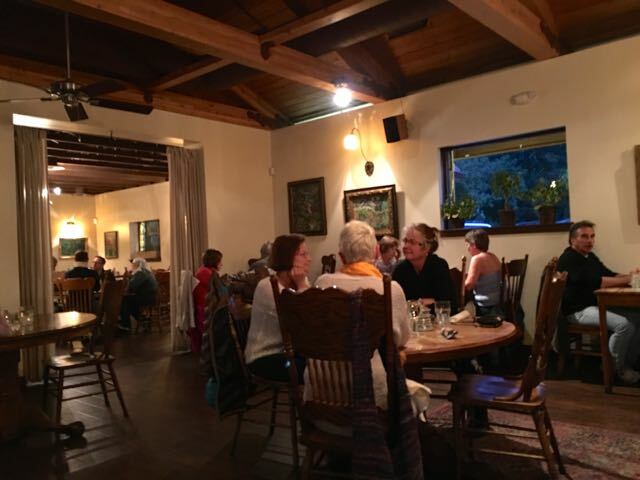 Nestled in a stone lodge, was a quaint, warm restaurant. With a very old-school feel, the restaurant's decor was cabin-like with large wood beams across the ceiling and old-school wood furnishings. 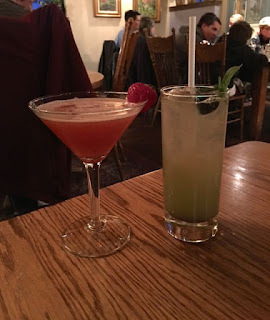 Me and my friend were seated near the bar. We were warned that Adam's is all about slow food rather than fast food -- real food cooked slowly. That sounds like my cup of tea. The warning came from someone who was insinuating that it may take a long time to eat there. But, it actually didn't. I started with the Tree Line Martini made with small batch whiskey, Three Pins Alpine Herb Liquor, fresh lemon, house ginger simple syrup, and bitters. It was good, but not fantastic. For dinner, there were a few items marked as vegan on their small menu like a spicy curry. I went with one of the "favorites" -- the Sengalese Vegetables. This dish was huge. Served over udon noodles was a mix of snow peas, carrots, onions, celery, cauliflower, and potatoes in a thick peanut sauce. 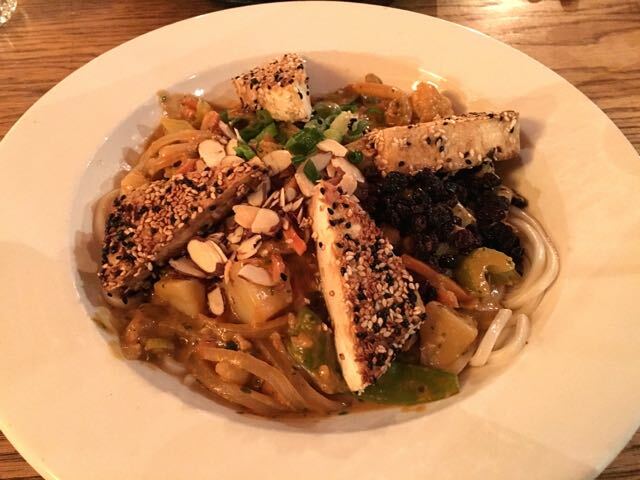 And I added sesame crusted tofu. I found it to be very, very filling and a good hearty meal, but there was a bit too much peanut sauce. I think it needed some fresh herbs for some oomph. Where this restaurant really shined though was with its dessert menu! A menu that changes regularly is printed on a blackboard. There were three vegan options on this day including a rice pudding. But, I ordered the Vanilla Bean Cake because it looked most interesting. 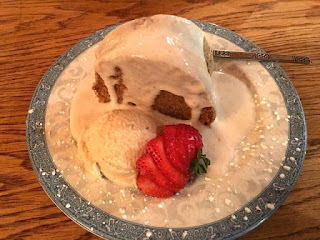 The super moist vanilla cake was topped with a lavender anglais and served with cashew cream ice cream. It was spectacular! All in all, of the few options in Colorado Springs, this is one of the best. The main dish was filling and fresh and the dessert was truly spectacular. The service was so-so as the restaurant was very busy. And the prices were high with my main dish being $18 alone. With two drinks, a main dish, and a dessert, my total with tip was about $60. But, hey, that's what you get in this small mountain town. I'd recommend giving it a try if you are in the hood.